Too Pretty to Ride a Bike? 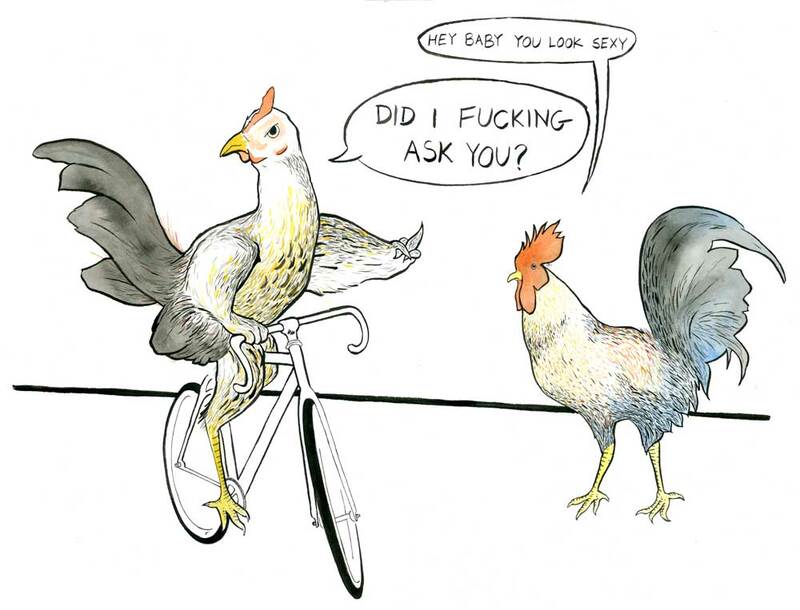 Go Cluck Yourself. I was recently sent into a spiral of anger whilst riding my bike, and it wasn’t for the usual cab-driver-turning-right-into-me-without-signalling kind of reason. I don't even think it was something that can be legislated against. To add insult to injury, I’ve always thought of my bike as the ultimate cure-all. Whatever kind of ailment I may be experiencing, (except certain asthmatic problems that arise when I mix cardio with cold weather) it can almost always be treated with a nice long bike ride. When I’m on my bike, it feels as if I can escape anything. It is the ultimate safe place. I was unable to think of a clever retort on the spot (which is, unfortunately, often the case when one is suddenly confronted with an injustice in public). Being too confused by what this person actually meant, I stayed silent and let my anger stew inside of me. I wondered: Was this man just trying to hit on me and was this really the most creative thing he could manage to spew out of his mouth? Was he trying to come up with something that would impress his fellow bike-hatin' bros? Was he operating under the notion that was considered outdated a hundred years ago that it is improper for a woman, or should I say a lady, to ride a bike? Did he think I was from the turn of the century? Was he hallucinating? Time travelling? Did he think that because I’m "feminine looking" that I couldn’t possibly be smart enough, practical enough, or athletic enough (not that you have to be athletic) to be a cyclist? Was he afraid I would develop the dreaded "bicycle face" if I persisted with my cycling habits? First off, anyone who still thinks that catcalling (which was what this man was doing) is an acceptable way to speak to women, is seriously delusional. Making women feel unsafe or uncomfortable is just not an okay thing to do. And, if you’re a man reading this and you’re thinking: “But how could me telling a woman I don’t know that I think she’s attractive, make her feel unsafe?” you must realize that because you’re a man, even if you’re sympathetic, you could never completely understand how it feels to be a woman. Allow me to mansplain this to you: I don’t know a single woman who feels good about being catcalled. Shouldn’t that be reason enough to not do it? Also, I couldn’t care less if a stranger considers me attractive and I would certainly never want to spend time with anyone who spoke to me that way. So, if the goal of catcalling is to get me to interact with you, you most definitely failed. But, in this particular case confusion still reigns supreme: I mean, what one considers to be attractive in a woman has to do with riding a bike is completely beyond me. Herein lies the rub: His catcall was so incomprehensible, but somehow still so very insulting. This drunken citizen of Toronto decided he needed to critique my mode of transportation in order to try to get me to talk to him. What the...? Overall, what bothers me the most about this whole situation is that there are men who, having grown up in a culture of male privilege, believe they have the right to tell women what to do and that every utterance of theirs is worthy of our ears. By telling me that I’m “too pretty to be riding a bike,” this man was trying to tell me that I shouldn’t do something that brings me so much happiness and that allows me to efficiently get where I need to be. He was trying to tell me that, clearly, he knows what is best for me. I really don’t understand why this happens, why some men, whether it is conscious or not, have this incredible superiority complex that allows them to think they can tell women how to live their lives. Why is this still happening? Haven’t we, as a society, outgrown this? Recently, on two separate occasions, I’ve had men come up to me and say something along the lines of, “You better make sure you lock up that bike nice and tight!” Thank you, first of all, for assuming that I am stupid enough to leave my bike (something which I rely on everyday for transportation and am fairly attached to as far as inanimate objects go) unlocked and unattended in downtown Toronto.. Secondly, if I did decide to leave my bike unlocked (for whatever inexplicable reason that might be) it would still be completely up to me. My bike, my call. I am so angry that this person attempted to shame me for cycling because he thinks I’m attractive. I am so angry that because I am young and a woman that certain men can’t consider the possibility that I might just be able to think for myself. I am so angry that certain men still don’t seem to care that their words make women feel unsafe. I am so angry that this is the state of things today. I am so angry and if you aren’t angry too, then what are you? Claire McFarlane is a managing editor at dandyhorse and a journalism student at Ryerson. Ian Sullivan Cant is a graphic designer and illustrator who has contributed to dandyhorse since issue one.